Christopher Bardell owns a dozen McDonalds restaurants in New Orleans. He’s donated thousands of dollars to the NOPD in cash scholarships, equipment, and free advertising. 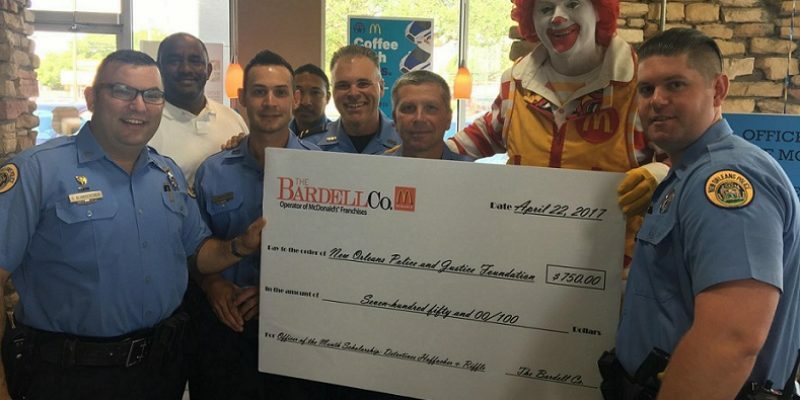 Bardell provides space at his McDonald’s restaurants to host NOPD public outreach programs, and he offers free coffee to officers. He also donates free advertising to the NOPD on the paper liners of the food trays in his McDonald’s restaurants. No doubt about it, Christopher Bardell is a friend of the New Orleans Police Department. Evidence is strong Mr. Bardell played a major role in the hiring of New Orleans Police Department’s recruitment director. The woman hired, Keia Stepter, was fired within a week for lying on her application. The job of recruitment director is a big deal for NOPD since the department is in desperate need of new, qualified, personnel. So why would NOPD brass hire Stepter, a former Mcdonald’s worker and someone hardly qualified for the job? Nine of ten years of Stepter’s work experience involves working for McDonalds owner and big NOPD donor Christopher Bardell. What makes Stepter’s hiring so suspicious is she was chosen over a number of obviously much more qualified candidates. Candidates included a former federal prosecutor, and a former sheriff’s deputy, who now manages human resources for NASA, and an applicant with a master’s degree in human resources management who worked with Iraq’s Minister of Interior to recruit officers for Iraqi Security Forces. On her application Stepter claimed to have had 10 years of professional experience after college which is the minimum required for the job. But the Civil Service review conducted after she was hired, found Stepter graduated from Southern University in 2014. A fact Stepter conveniently left off of her application. Stepter’s former boss, Christopher Bardell, denies knowing his former employee applied for the NOPD recruitment director job and he claims he only learned about it after NOPD contacted him as a listed reference for Stepter. Seems odd doesn’t it that Stepter wouldn’t first tell Bardell she was applying seeing that he has so much juice with NOPD, being a big donor and all. Bardell also claims he had no contact other than the reference call with any NOPD official or anyone at City Hall over the hiring of Stepter. That must have been some interview! Maybe there were a lot of questions about Big Macs, French Fries, and hot apple pies. Tidwell also denied Stepter was hired because of her connection to Christopher Bardell. I suppose we are expected to believe choosing a former McDonald’s worker with close ties to a big NOPD donor over much more qualified candidates is nothing more than just a big coincidence. A very big coincidence.